Play That Funky Music . . . No, please do! This review is with a couple of drops of water to about a 25ml pour. Nose - A lemon and pineapple infused malty base with a lot of overripe fruits – a bit like a tropical fruit stall at the end of a hot day. Salty with a little waft of peat. Gingery with some spice and toffee emerging. 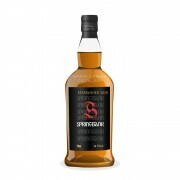 Taste - Full and lots going on, with more spice, liquorice, tropical fruits again and that pleasing oily texture one finds with Springbanks. Not as much ‘funk’ as I’d been expecting to be honest. A very nice whisky that is balanced, complex and quirky in true Sprinbank style. But, truth be told, this hasn’t wowed me like I thought it would. I think the 10 and 15 have some sherry in the mix and this, according to Master of Malt anyway, is solely bourbon matured. Perhaps it lacks something that the sherry brings to the table as I feel that, while this is unquestionably high quality whisky, it seems to lack something that I’ve found in other Springbanks. Still very good though. @Hewie - Cheers, mate! I've only had the 10 and 15 (with a 12 CS lurking . . .) but I distinctly remember a lot of that 'funk', especially in the 15, which was also the saltiest whisky I think I've ever had. I'd probably have to agree with @wierdo's assessment that one would be better off with a 10/15 and the 12CS for about the same money as this (or less). I think I agree with the general opinions here. I only ever had the 18 once at a bar, but I saw no reason to ever spurge on it over the 10 or 12 CS.